There are many reason to consider a tower fan heater also referred to as a table-top heater, space heater or any smaller portable type heater will fit in this category. The tower fan models usually are tall and slender providing an esthetic look to any room. With that said there are many shapes and sizes to choose from as your choice will ultimately be on what fits your budget, size room and your heating situation. 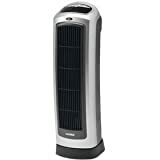 This review will be a general review geared towards the tower fan heaters on the market. Singling out merely one or two types are purposefully avoided so the reader may make an informed decision on which direction to go. With winter coming on strong it's important to make the right decision now so you do not find yourself freezing in the middle of the night only because the heater you picked is the wrong one for you and your home. The types of heaters that are made in the portable size vary and below are the popular ones to consider. These heaters are a very efficient heater that will not break the bank when it comes to pricing. Most of them work by heating a coil and using a fan to blow the air over the heated coil. That is at its simplest terms. Depending on the price and model, there are many different features that come with these units. When picking a tower fan for heating your room you do not want to decide only by price. With that said, just because a unit may be priced high and list many features, you will not be guaranteed that it is the perfect one. It is recommended that you refer to Amazon or any other big online store that allows the consumer to write actual reviews on their purchase. Although we have listed general pro's and con's for the tower fan heaters, we have found that this accurately generalizes the good and bad for you. There are always little nuances that will be specific to your device, just because each piece of equipment is not exactly like the other. It is recommended that you get the following information before shopping for your unit. Measure the size of your room by getting the length and the width of the room and multiply them together, so a 6 by 9-foot room would be 54 sq feet. it's a good idea to make sure the room in question is properly wired for the heater's rating to wattage demand, since a space heater, portable heater or tower heater pulls a lot of wattage. I was forced to have the breaker to my bathroom changed because the heater I was using kept tripping the breaker if I turned it to a higher setting. Of course this resulted in an extra cost since I needed an electrician, but it pays to be safe and make sure the room can handle your unit. Based on our research some recommended brands to look at are: Check out my individual reviews on the Lasko, Holmes, Honeywell, and Vornado heaters by clicking their respective names or just click here. Also on each page of the site I provide a search feature in case you haven't found what you're looking for. An informed decision more times than not lend itself to a happy experience when you finally make your purchase. It is our wishes that you find the information you need in order to make an educated decision.